Cheap personalized groomsmen gifts may cut overall wedding costs, but its one wedding item most couples don't want to scrimp on. Gifts for attendants are an important show of affection and appreciation. Luckily, there are cheap gifts for groomsmen that won't break the wedding budget. A groomsman is more than a wedding prop: he's the guy who will make sure the groom's tie is straight, will help seat guests at the ceremony, is on call when the bride has a meltdown, coaches the groom through tuxedo fittings, helps arrange a final fling bachelor party, and above all, reassures the groom that he won't regret marrying the most wonderful woman in the world. That depth of friendship cannot be belittled, and many grooms choose meaningful gifts to present their groomsman as tokens of their ongoing friendship, appreciation, and thanks. As wedding expenses rise, many couples look for ways to trim their wedding budget without cutting the guest list or sacrificing meaningful parts of their day. With careful shopping and consideration, there are many thoughtful groomsman gifts that don't require much money to give. Sporting event tickets, especially to local or minor league teams. Many teams also offer meal deals or other promotions that can be purchased in advance. Engraved keychains, lighters, or money clips. Shotglasses from the wedding location or personalized with the date of the ceremony. Pledge coupons for the groom to "serve" his groomsmen just as they've "served" him before the wedding - offering to mow a lawn, wash a car or change the oil, rake leaves, or take over other household chores for a day (after the honeymoon of course) is a fun and thoughtful gift that may not cost a penny. Baseball caps or t-shirts embroidered with the word "Groomsman" or the date of the wedding. Painting the personalization is an even cheaper alternative. Movie tickets, restaurant gift certificates, or other vouchers for the groomsman to enjoy a special time with his significant other, just as he's helped the groom have a special time with his beloved. A magazine subscription, favorite movie, book, or CD. Not every groomsman gift must be directly related to the wedding, but a nice gift is a great way to show appreciation. Finding inexpensive gifts is not difficult. Many items can be purchased in bulk for a lower price, which is especially helpful if the bridesmaid gifts will be the same. T-shirts to paint may be purchased at a discount retailer or thrift store, while work voucher coupons can be printed on a home computer and won't cost anything. Discount event tickets and meal coupons can be found in coupon books or by exploiting different connections, such as buying tickets through work under an employee discount. Cheap groomsman gifts may not be appealing to all grooms, even if their budget can't support something more expensive. In this case, there are many alternatives to cheap gifts that will be just as appreciated by the groomsmen. Offer to pay for their tuxedos instead of having groomsmen pay for their own attire. Group rental packages can make this a fairly inexpensive alternative while ensuring that everyone is suitably attired for the big day. Similar options include paying for haircuts or shaves before the wedding. Take all the guys out to breakfast or lunch the day of the wedding as a group thank you gesture. This guarantees they will have the energy for the wedding festivities and gives the men an opportunity for a last event together before the nuptials. Note, however, that alcohol should be carefully monitored, if not completely absent, to avoid any complications close to the ceremony and reception. Arrange to chauffer the groomsmen to the ceremony in the limousine (if one will be used) before the vehicle will pick up the bride. An extra hour's rental may be less expensive than individual gifts, but be sure there will be enough transportation to take everyone to the reception as well. If the budget is very tight, even cheap groomsman gifts may not be possible. In this case, it is imperative that the groom be gracious and heartily thank all his groomsmen in person (which he should do even if presenting them with a gift). A personalized card could be used, or the groom may make a toast to his groomsmen at the wedding rehearsal dinner or reception, making his thanks and appreciation public. Even without a gift, that heartfelt acknowledgement will be long remembered. Cheap groomsman gifts are one way to help trim a wedding budget, but even inexpensive gifts don't need to be tacky or inappropriate. 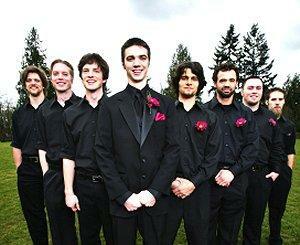 With careful thought, a groom can easily thank his attendants in a sincere, honest manner no matter how low the price.